Today (Wednesday 30th August, 2017) saw another step forward in Cayman’s commitment to sustainability with a ground breaking celebration for the island’s first LEED (Leadership in Energy and Environmental Design) certified housing development, Periwinkle. Hon. 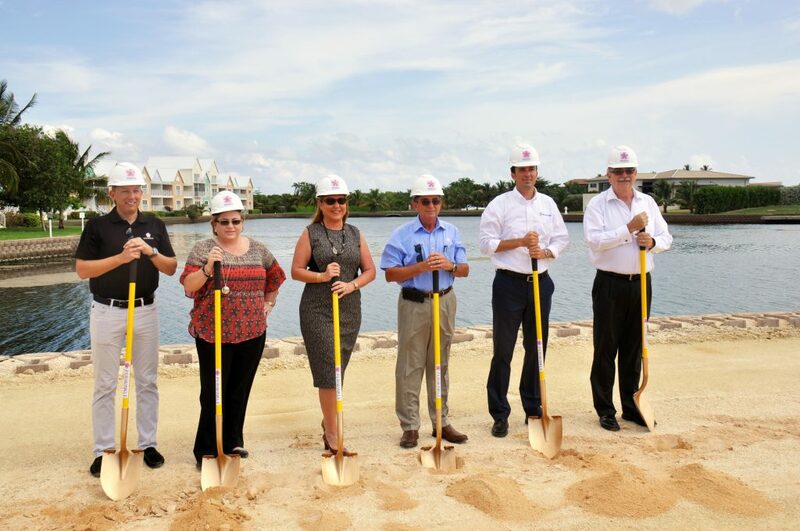 Roy McTaggart, Minister of Finance and Economic Development, attended the ceremony this morning, marking the official first day of construction at the waterfront site at Grand Harbour, located off Edge Water Way, left of Hurley’s Marketplace. The Minister was joined by Periwinkle team members, including Chairman, Herber G. Arch, Project Manager, Ryan Ostendorf and Managing Director of contractors, Arch & Godfrey, Garth Arch, as well as other stakeholders and members of the media. The nine-acre area is situated on the waterfront, with striking views over the canal. The development will comprise of 20 Cottages, 28 Courtyard Townhomes, 23 Waterfront Townhomes and 10 Luxury Villas, known as The Point. All houses will be built with modern Caymanian design in mind and set to be completed by fall 2018. Periwinkle will be the first community in Cayman to be LEED certified – the pinnacle of green accreditations. Solar power will be the main source of energy for Periwinkle’s homes, streets and dock, as well as across all of the community’s amenities. Periwinkle’s homeowners will be connected through shared amenities, including a 60ft swimming pool, club house, BBQ area and outdoor kitchen, aqua paradise hot tubs, kid’s wet zone, paddle boards, kayaks, open green spaces, walking and running paths, a secured entry way and a farm to table delivery program. “Periwinkle incorporates traditional design with modern living. The innovative architecture and design of the development combines Cayman’s heritage with sleek modern lines, creating a timeless home,” said Ryan Ostendorf, Periwinkle’s Project Manager.